Downtown Special: Kunio-kun no Jidaigeki da yo Zenin Shūgō! (ダウンタウン スペシャル♥ くにおくんの 時代劇だよ 全員集合！, roughly "Downtown Special: Kunio's Historical Drama - All Together Now!") 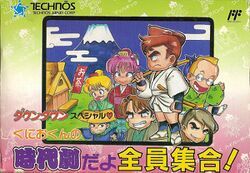 is the Japan-only sequel to River City Ransom (known as Downtown Nekketsu Monogatari in Japan). It uses the River City Ransom engine with various improvements, such as visible damage numbers (to show how much damage attacks are causing), a computer-controlled ally (if playing single player), and a free-roam world map. Many of these improvements were later integrated into River City Ransom EX. The initial plot is simple: Kunio's sensei, Bunzo, has been struck down by a mysterious illness, and Kunio needs to find Kanpou to heal him. On the way, however, many events unfold. Two years after the Famicom release a Game Boy port was released with some minor aesthetic changes. In 2006 the Famicom version was released on the Game Boy Advance as part of Kunio-kun Nekketsu Collection 3. No version of this game has ever been released in English, but there is a complete English patch for the Famicom version as well as an alternate patch for disabling the damage numbers. A partial translation has also been made for the Game Boy version. This page was last edited on 23 June 2013, at 00:30.